The free app allows you to view the current status of your Adafruit.io data feeds and visualise the changes over time in your data. The app works on all your Apple devices and your preferences are synced using iCloud. Customize the icon corresponding to each of your feeds with fun emoticons. On the io.adafruit.com website you will find your AIO key. Type in the key manually or scan the QR code. For easy setup on Apple TV, we recommend that you first scan your QR code using the app from an iPhone or iPad. Then the DataFeeds app on the Apple TV will know to use the same key. From your iPhone or iPad choose an emoticon for each of your feeds. For example, you can use 🌡 for a temperature sensor, 💧 for a humidity sensor, and 💡 for the status of your lights. This preference is synced across your Apple devices, so your changes will be visible on your Apple TV as well. 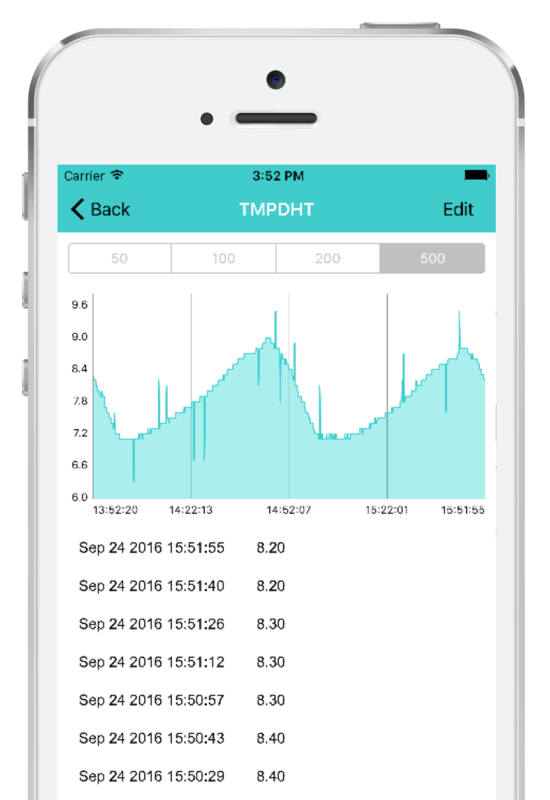 The app supports auto-refresh, so you can use the app as a monitoring dashboard that periodically updates to show you the latest data. The refresh rate can be configured inside the app. Set the refresh rate depending on your data and your needs. Depending on the granularity of the data, you can set a higher or lower refresh rate for both the main screen and for the feed details chart. Download the PDF guide or watch our intro video. DataFeeds is a mobile application developed by MonoHelix Labs, a small company working within the area of software development, IoT, data analysis, consulting and publishing. DataFeeds is not affiliated with Adafruit IO or Adafruit Industries. Let us know what you think! Contact us at contact@monohelixlabs.com or through social media channels. Search for DataFeeds on the App Store from your iPhone, iPad or Apple TV.